One of the problems associated with imaging fluorescence in large biological samples is the obscuring effects of light scatter. Traditionally this has meant physically sectioning the material into optically-thin slices in order to visualise microscopic structure. With the advent of new volumetric imaging techniques, e.g. lightsheet microscopy, there is increasing demand for procedures that allow deeper interrogation of biological tissues. With this in mind, an innovative clearing system has recently been purchased through generous donations to the European Cancer Stem Cell Research Institute (ECSCRI). 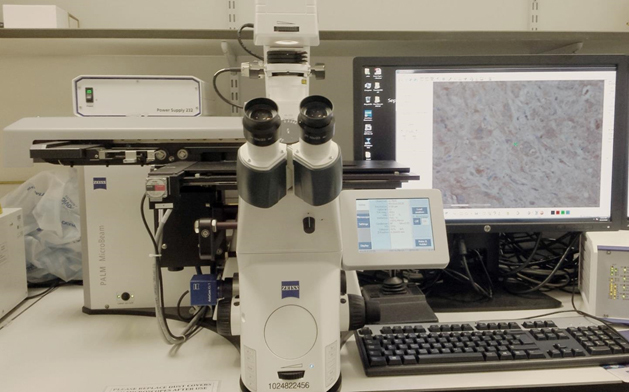 The equipment, which will be housed in ECSCRI lab space, allows large, intact histological samples to be rendered transparent for fluorescent labelling and 3D visualisation by confocal and lightsheet microscopy. The X-Clarity tissue clearing system is designed to simplify, standardise and accelerate tissue clearing using the CLARITY technique (an acronymn for Clear Lipid-exchanged Acrylamide-hydridized Rigid Imaging/Immunostaining/in situ-hybridization-compatible Tissue hYdrogel). In the technique, preserved tissues are first embedded in a hydrogel support matrix. The lipids are then extracted via electrophoresis to create a stable, optically transparent tissue-hydrogel hybrid that permits immunofluorescent labelling and downstream 3D imaging. The new equipment and associated reagents will have wide relevance to many areas of research in Cardiff, including deep visualisation of breast cancer tumours by Professor Matt Smalley’s research group using the Bioimaging Hub’s new lightsheet system. 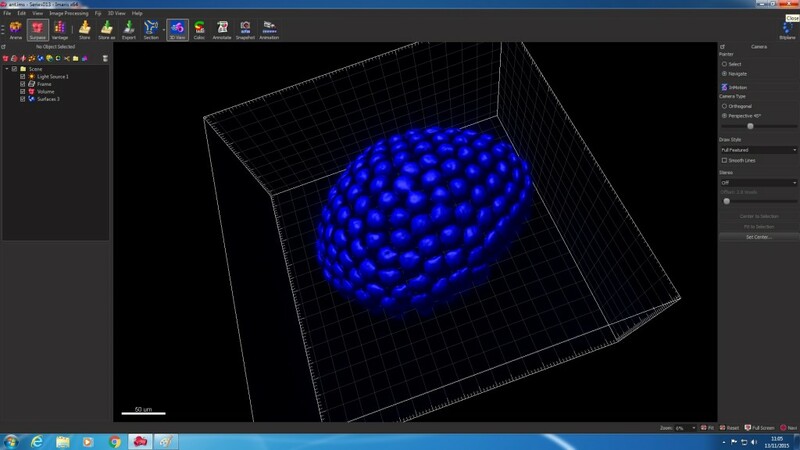 You can see a video here that shows the power of the CLARITY technique for high resolution 3D visualisation of tissue and organ structure. Richardson & Lichtman (2205) Clarifying tissue clearing. Cell 162: 246-257. Chung et al (2013) Structural and molecular interrogation of intact biological systems. Nature 497: 332-337. This entry was posted in equipment on June 7, 2018 by Anthony Hayes. A Zeiss PALM MicroBeam laser micro-dissector system is now available as a spoke of the Bioimaging Research Hub. The equipment, which is located at the European Cancer Stem Cell Research Institute (ECSCRI), allows isolation of DNA, RNA and protein from laser micro-dissected samples from both histological sections (paraffin wax or cryo) and live cells. Further details of the system are available through our equipment database. All enquiries for this system should be directed towards Mr Mark Bishop. This entry was posted in equipment, news on January 10, 2017 by Anthony Hayes. 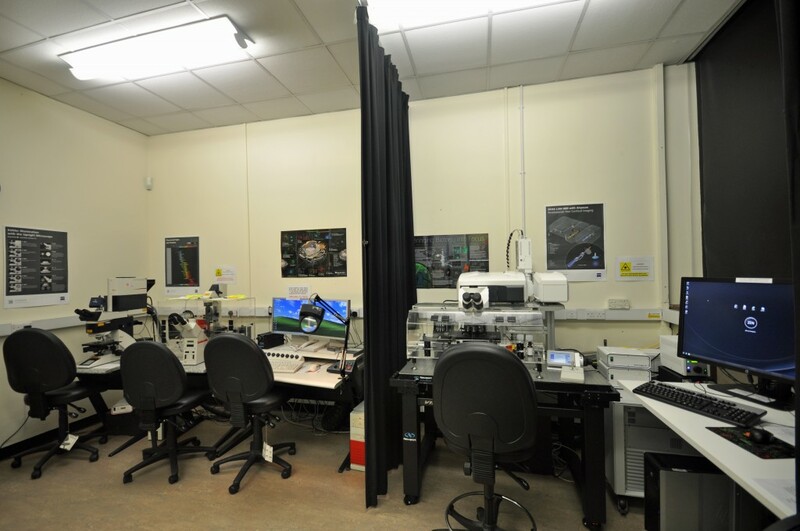 The old electron microscopy darkroom (BIOSI 2; E/0.05) within the Bioimaging Research Hub has recently been refurbished as a live cell imaging suite via generous support from BIOSI. It now houses a spinning disc confocal system for fast, live cell imaging applications. 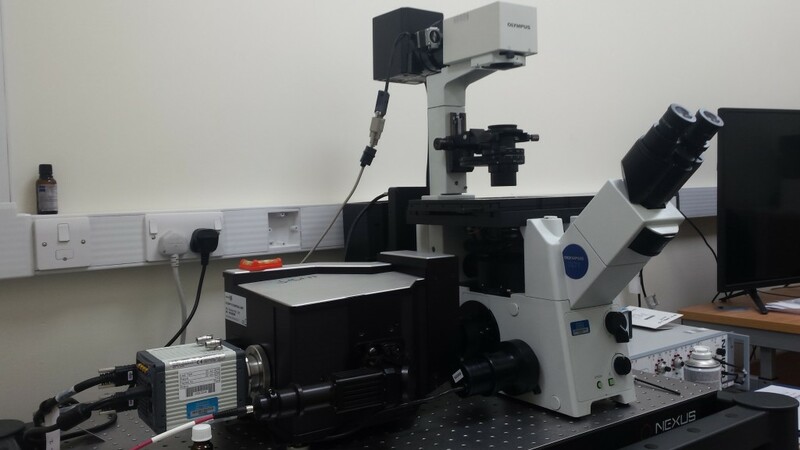 The system is based around an Olympus IX71 inverted microscope, kindly provided by Dr Pete Watson, which has been upgraded, via ISSF funding, with a Crest Optics X-Light V2 confocal head, a Cairn Research tri-line laser bank (405nm, 488nm, 561nm) and a Hamamatsu ORCA Flash 4 sCMOS digital camera with M-View Gemini image splitter. The system is fully integrated via Molecular Devices MetaMorph software and boasts a 40″ 4k display. The system will expand the Hub’s imaging toolbox, enabling high speed, multi-position, multi-colour 3D/4D image acquisition. Support systems for live cell imaging (i.e. gas and incubation) are also available within the facility. Further details of this system are available through our equipment database. 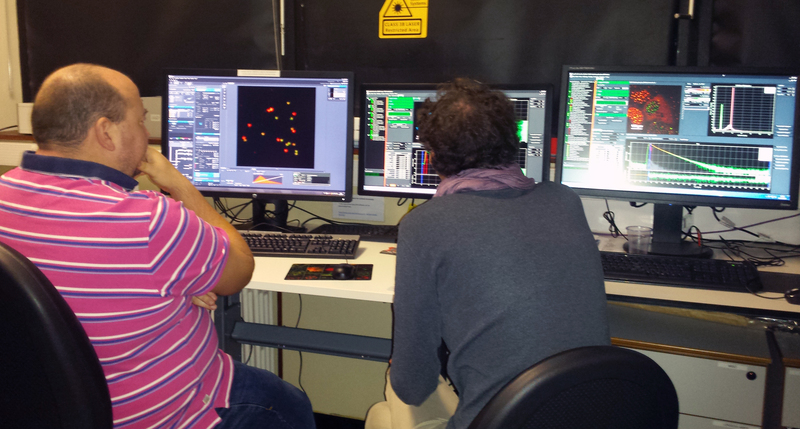 Image: Dr Pete Watson (left) gets to grips with the new Picoquant FLIM module. Dr Volker Buschmann of PicoQuant (right) provides expert advice. Our new Zeiss LSM880 Airyscan confocal system has now been upgraded with the PicoQuant FLIM module for Fluorescence Lifetime IMaging. This module provides an additional two lasers (picosecond pulsed 440nm and 485nm diodes) and utilizes the Zeiss BiG.2 GaAsP detector to allow time-correlated single photon counting (TCSPC). The FLIM module is run through Picoquant Symphotime software, which integrates seamlessly with the Zeiss Zen Black confocal software. This entry was posted in equipment on December 16, 2015 by Anthony Hayes.